First of all I would like to thank to all of our guests here tonight for joining us. Special thanks to Mr. Karagoz, Mr. Cene, Mr. Conklin, Mrs. McClintock, Mr. Hotard who have traveled from out of state/ country to honor us tonight. Most of our members already know that my interest and passion for SKAL has begun during my college years when I was studying Hospitality Management at Bilkent University in Ankara. I was introduced to SKAL by our professors who were members of SKAL Club of Ankara. One of them was Mr. Kamer Rodoplu who has been a role model for me who is currently serving as the SI Counselor of Turkey. SKAL is an international organization whose members are the crème de la crème of the travel and tourism industry and I have set myself the goal to be part of this prestigious organization when I was ready with my credentials. 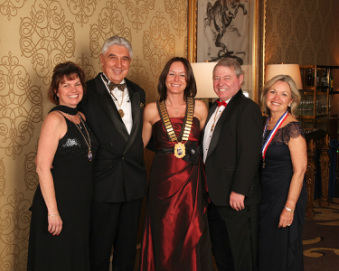 In 2009 January I joined SKAL Atlanta Club as an active member. In 2011 I was given the opportunity to become a member of the Board where I was dedicated to serve for the Club and help it grow. I have started as Asst. Secretary, performed the Treasurer/ Secretary positions and completed my term as VP in end of 2013. I have worked in establishing a new website for our Club, initiated visibility in social media and on other projects that has helped carrying our Club to next level. I have also served as the Chair for the Auction Committee. During the three years of my service as the Auction Chair we have generated over $ 75,000 for the Club which has been used towards our Scholarship funds. We have been able to secure scholarships for tourism & travel students in GA. Knowing the importance of the young generation for our Club’s future I have also been working in projects related to Young SKAL for our Club. I would like to take this opportunity to thank to our Past Presidents Lorene Sartan/ Laura Heidt and Kenny Song who have allowed me to work in their board and serve for the club. Every year each President has set the standards higher for serving the club. Today I am truly honored to become the President of SKAL Atlanta. As the President of the Club I will make sure to work for the best interest of our Club by trying to contribute to its growth. I will lead our Board and the Committees in working to increase our membership numbers and position our Club within the top 5 largest clubs in the USA. Our new board and the committees’ will continue to work on several important projects; we will establish close contact with the Tourism Department at the Governor’s office, the upcoming Auction we have in April will be one of the projects we will continue to work on again to generate more funds for our scholarships and continue to work on projects for Young SKAL to increase awareness about SKAL among tourism & travel industry students/ young professionals; we will work on projects that will increase active participation of our members and allow them to do more business among friends; we will work on increasing the awareness of SKAL within the local industry and generate PR for the local Club and SKAL International in general. Our goal will be to make sure that SKAL Atlanta Club will open to international arena more where we will continue to twin with SI clubs around the globe that will increase the opportunity of doing business among friends on international level for our members. In 2014 SKAL Atlanta will have more participation in all areas of SKAL International and SKAL USA projects/ meetings/ activities. Before I finalize my speech I would like to extend my appreciation to my mentors Manny Beauregard, Phelps Hope, Gail Evilsizor, Richard Tilley, Harry Huff, Lorene Sartan and Marylou Foley who have always mentored me and supported me since the day I joined SKAL Atlanta. THANK YOU ALL!